The following letter has had names removed, except those previously cited by broadcast and print media (public domain). -Eds. Fri, 5 Aug 2016 at 11:41 p.m. 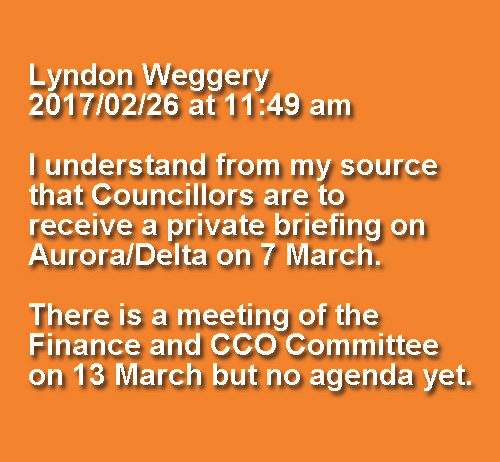 Message: I have read concerning comments on your site regarding DCC’s apparent failure to comply with its LGOIMA obligations. You may wish to post my account of my recent experience. Dunedin City Council took ten months to produce its second Infrastructure Report, entitled ‘South Dunedin Public Infrastructure During June 2015 Flood Event Follow-Up’ (Author: R. Stokes). On 28 January 2016 (still three months before the report surfaced), then DCC Group Manager Transport Ian McCabe told the Otago Daily Times “the lengthy timeline was needed to ensure the report was robust, including an external peer review of its findings”. Mr McCabe went on to emphasise that “the report had been widened from an initial focus only on mudtank maintenance, and now also included a fresh look at the network’s design capacity”. That all seemed fair enough. When the report was ultimately released in late April 2016, it contained no reference to any external (or other) peer review. However, when interviewed by John Campbell on Radio NZ’s Checkpoint programme on April 22, shortly after the Report’s release, Mayor Cull repeatedly referenced “independent” peer review(s) as supporting (“parts of”) the Report’s content. Mr Cull stated that he didn’t know which parts of the report had been reviewed independently. “You would have to talk to her (Ms Stokes) about that,” he said. Presumably, therefore, he hadn’t seen the review(s) either. On 17 May I sent a LGOIMA request to DCC Chief Executive Sue Bidrose, asking for a copy of the review(s). On 20 May I received an acknowledgement from DCC which rather defeated the purpose of my request but, more importantly, indicated that I would receive a response asap, but within 20 working days. I immediately queried why it should take such a long time to simply send a copy of a recent review, and asked simply for confirmation whether the review actually existed. This time I received an email from the Group Manager Corporate Services suggesting a “discussion” before they left for overseas. There was no mention of my straightforward query as to whether the review actually existed. I replied immediately, and asked again for a simple yes/no to that question. Again, the question was not answered. I considered that response was unsatisfactory. The review, apparently under belated construction, was clearly not what I had repeatedly requested. I should by then have received the review referenced by Messrs McCabe (“external”) and Cull (“independent”), or received an acknowledgement that it did not exist. Then on the evening of 6 July I was emailed by the General Manager Infrastructure and Networks, a copy of a new review, seemingly hot off the press, and authored by Opus in Auckland. This obviously was not the review that I had requested back on 17 May, as all DCC personnel involved should have known. Why, almost two months after my original LGOIMA request, I had still not received an admission that the peer review sought did not in fact exist? Or, alternatively, if it did exist, why had it not been provided? Why it took a month after my initial request for me to be merely told (irrelevantly) that a (different) peer review was being prepared, but with no attempt to satisfy my simple, legitimate request? Almost a week later, a DCC officer returned to the list of respondents. They advised that my (follow-up) enquiry was being treated as a new request, and (you all know the drill) would be dealt with as soon as possible, but within 20 working days of receipt at the latest. So external means internal in the DCC, and widening means narrowing? If the manager had been informed correctly, then there was no external review. Why, in that case, was I not told that nearly three months ago? Why did the Mayor apparently believe there was an external (independent, to use his wording) peer review? Furthermore, why did DCC fail to answer my three questions above. I could, of course, ask these questions of DCC via LGOIMA, but I could then only expect an interim response followed by 20 more working days of inaction and worse. Instead I have initiated a series of complaints to the Ombudsman, and decided that the public should view yet another example of how our City Hall is operating. My intent throughout has been to identify the true causes of the June 2015 flood, so that real solutions can be identified and “political” solutions avoided. I have no intention of stopping, despite DCC’s apparent resistance. Neil Johnstone is welcome to publish emails supporting his story; it appears most if not all of the emails he received pertain under the Local Government Official Information and Meetings Act and therefore reside in public domain. However, the Ombudsmen are best to advise on these matters. In the meantime DCC is welcome to correct any factual errors, in the interests of accuracy and balance. -Eds. Tagged as 3 June 2015 Flood, DCC, DCC Infrastructure and Networks, DCC Transport, Dunedin, Dunedin City Council, LGOIMA requests, Local Government Official Information and Meetings Act 1987, Peer reviews, South Dunedin, South Dunedin flood, Which peer reviews?